For those who are suffering with fire and smoke damage, you are in the right place. 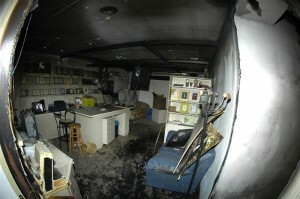 We understand how difficult it would be to imagine having a fire inside of your business or home. Even though you might think it won’t happen to you, there is no way to guarantee something completely out of the blue couldn’t go wrong. Even small fires can cause a world of damage to your structure. If you have recently experienced fire or smoke damage the team The Master Craftsman, Inc offers emergency fire and smoke damage cleanup services. Our team of professionals will come out and help you put your life back on track. Just because a fire happened, that doesn’t mean it’s the end of line for your business or home. Our team of knowledgeable professionals is the first line of defense in putting the pieces back together. Not only will fire destroy everything it touches, but it can also create a bunch of soot that will stick to your ceilings, walls, floors and everything inside of the property. You have probably seen soot at one time or another. You know that black stuff that seems to stick like tar to everything. Who wants that hanging around their property after suffering through a devastating fire? Smoke can leave behind an odor that is hard to eliminate from your structure, not to mention the stains. All of those black stains creeping up your walls can be quite devastating. Just thinking about how to repair them is more than some people can handle. Rebuilding your business or home is a process that requires a lot of time and dedication to make sure the job is done right. Design, materials and finishes will all have to match with the existing structure to blend everything together. The smoke odors have to be neutralized in all of the different components that remained behind, otherwise it will end up taking over anything new you do to the property. You don’t want to invest all of that time and money only to have it destroyed by a foul odor that wasn’t taken care of beforehand. Upon arriving at your property, our team of professionals will take the time to secure the property to make sure no additional damage occurs. We don’t want any of your precious items to deteriorate when we can do something about it beforehand. Our goal is to safeguard as much of your property as we can right from the start. With all of the various restoration methods available today, we can save a lot of your personal items and building components to help save you money and time. Even when the damage looks atrocious, there are a number of items that can be restored to their original condition before the fire occurred. When you give us a call, we will head out to your property right away to help mitigate the amount of damages you sustain. From the minute we enter your property, we get to work restoring your home or business. Give us a call to discuss what you need done.